Walker Space, at 46 Walker Street, is a walker’s five minute stroll from the Canal St. R and Q stop. The two one-act plays, written in the last year of Tennessee Williams’ life, are directed by Cosmin Chivu. With lightening design by John Eckert, Scenic Design by Justin West, Costume Design by Angela Wendt, and Original Music by Paul Brantley. 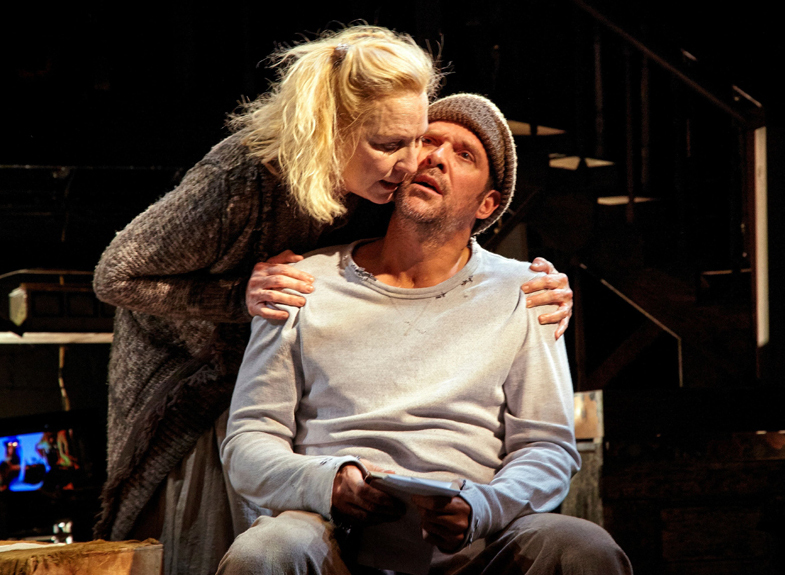 In “A Recluse and His Guest,” America’s most poetic playwright invents a prosaic Baltic folktale about a pariah in animal skins who wanders into “a far northern town in a remote time,” where she persuades Ott, the town recluse, to allow her to take shelter from the sunless winter in his barricaded dwelling. Under other hands, this little play would have stalled out as a simple fable about those who thrive on forward progress and those who don’t. But in an astonishingly short amount of time, the precise language of Tennessee Williams brings to life an entire relationship of depth and intimacy, from the first meeting to the last, between the sort of personalities that Gore Vidal referred to as the gardener and the flower. Vidal proclaimed it the ideal pairing but not without its pitfalls – especially when one is as passive aggressive as the woman called Nevrika, even if she is played to utmost sympathy by Kate Skinner. Ms. Skinner’s small, honest acting seems out of place at first, as she enters an open, expressionistic set cobbled together from strips of scrap wood, strewn with old televisions and the presentational staging of various broadly-gesturing townsfolk. It all results in a bit of verfremdungseffekt, reinforced by a live cellist in the murky back corner whose edgy music sounds like it must have been composed by someone with a name full of hard consonants and maybe an umlaut. And that bedraggled wanderer is alienated. As a freakish fugitive who understands the speech of birds and beasts, she is treated rather beastly by all she encounters, until she finds the recluse who didn’t know he needed her disturbing but well-intended influence. The dark lighting, expressive citizenry, and falling snow (on the TVs) promote the mood of a Grimm (and grim) fairytale. But they also nicely set up the secluded sense of intimacy, once the couple is ensconced behind boarded windows, where the performances take on a natural feel. There, his resistance and her persuasion roll over themselves, and change is slowly affected. Ford Austin’s Ott is ripe with insecurity masquerading as misanthropy, and proves nicely cathartic as he comes out of his shell. Over the bleak winter, Nevrika thaws Ott’s gruff, suspicious heart with a woman’s touch and good cooking. He bellows impotently against her efforts to improve the home and her new man, which she ignores with persistence and the surety that it is all best for both of them. Ultimately she has him bathed, groomed, and duded up before presenting him at the Spring Festival, where he is declared the city’s handsomest man. At the height of her proud success, he rejects the makeover in a moment of curmudgeonly, paranoid relapse, and condemns her to eviction. This he immediately regrets and rescinds. But it is too late. She can never go back in her life, only forward, even if the only place left to go is out on the ice in the harbor and certain death. Perhaps not unlike the freeze-out Mr. Williams received by the critics, when he refused to repeat his commercial hits from the early ‘50s, and the very public execution his reputation suffered, even as he churned out play after play, exploring and writing in new modes of expression, long after he had been written off and declared artistically dead. The cautionary and relatively gentle folktale of “The Recluse and His Guest” is paired with “The Remarkable Rooming-House of Mme. Le Monde,” an absurdist piece that is as kinetic as it is brutally funny, foul-mouthed, and bordering on the obscene. It is hard to imagine two pieces being more different, coming from the same mind in the same year. When the lights come up on the London attic in “The Remarkable Rooming-House of Mme. 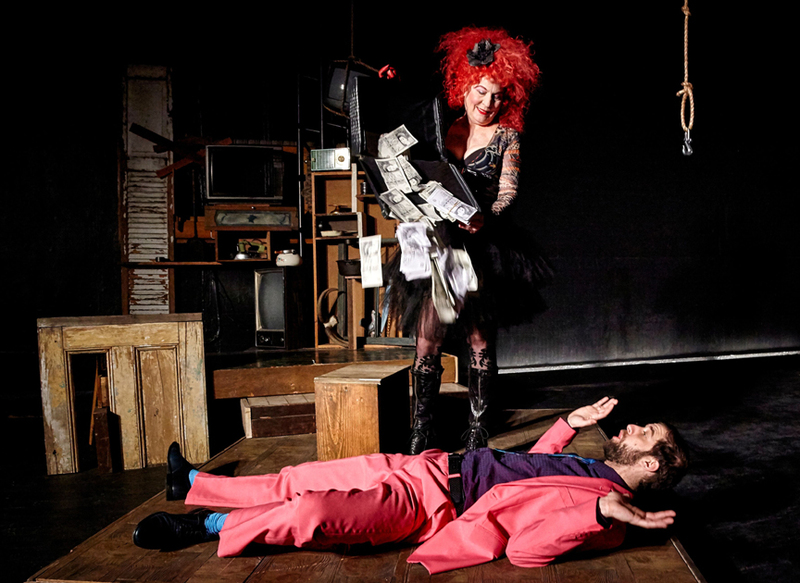 Le Monde,” the title character stands in the slutty black grab of a Punk Rock lady-of-the-evening, haughtily unperturbed by the manic cackle of the young hooligan careening across the stage on his skateboard. After she rebuffs her son’s sexual overtures to attend to a visitor below stairs, he ascends to a cluttered loft, where he drags out a crippled young man named Mint, who he promptly depantses and ruthlessly buggers to the pealing distortion of an electric guitar, before sauntering off. Next appears Hall, an old school chum of Mint’s from their days at Scrotum-on-Swansea. He is now a successful broker, as well as Madam’s most recent rodger. Mint had invited him to tea, which Hall wolfs down while crowing about his various sexual conquests and ignoring Mint’s pleas for assistance in getting over to the goodies before all are gone. Mint explains that he is living in the garret on Madam’s charity, but is now left to scant rations. Hall couldn’t care less and begins sucking down tea two mugs at a time. Mint transports himself by a series of thick ropes dangling from a beam. Each has a large mental clasp that he fastens to a ring in his torso, which allows him to swing in midair from one rope to another. The task requires feverish effort, to hold himself up by the new rope while he disconnects one clasp and secures the next. Jade Ziane’s acrobatic performance as the pathetic Mint is delightful, as are his many failed attempts to Tarzan his way toward the tea biscuits. Invariably he falls to the floor with considerable violence before reaching his goal. Hall helps him back up to the ropes eventually, but always as far away as possible. The hedonistic Hall is played with effervescent self-absorption by Patrick Darwin Williams, who provides a ripping yarn about abusing a trollop in a taxi, before exiting to seek out the landlady, leaving poor Mint to another buggering by the gleefully menacing young one, played by Declan Eells, who makes the most out of his brief but memorable appearances. And so too brief is the appearance of Ms. Skinner, but her return is a doozy, and her soliloquy at the end is short, but as illuminating and cold-hearted as the moon she evokes. Williams roundly takes the Mickey out of the British in “The Remarkable Rooming-House of Mme. Le Monde.” The setting and action is Pintereque. But even if the playwright consciously employed absurdist forms that had already appeared in plays by the likes of Beckett, Pinter, Joe Orton, and Sam Shepard, the language and themes are all Tennessee, and the play was actually ahead of its time. There is no way this would have been produced in 1982, as it is more explicit in its hilarious depravity than anything coming from the profane pen of Carol Churchill in that era. It seems an injustice that these other writers were received with open arms as fresh and exciting, and yet Tennessee Williams was summarily dismissed for ever stepping outside of the box that the public and the press had put him in thirty years earlier, as if he were the invalid left in the attic. For all his exploration and departure into fable and absurdity, Williams in the last year of his life continued to mine poetic riches of the same imagery and themes he returned to again and again. For instance, in the fable, birds are used to represent the gentler human spirits among us, both those that are caged or forever migrating. And the most well dressed and respectable character in each of these one-acts is a corrupt hypocrite. Only here they literally screw their victims, when not denouncing as unnatural the acts of the “whore” or the “fag” they casually sexually abuse. And those branded as degenerates turn out to be the most decent individuals to be found, whose desire for a little comfort and compassion remains unrequited, and whose reliance on the kindness of strangers and friends alike only leads to their ultimate unavoidable destruction. It was as if Tennessee Williams was driven forward because he felt he never quite got there, where his theater of pageantry and symbolism was perfected, and where he might one day finally express in the purest poetry that lone human spirit desperate for inclusion, acceptance, and safety. Cosmin Chivu’s production allows each play its own style, pace and life. But it is the performances by the actors, across the boards, that fill them with such palpable life. The set, lights, and costumes work very well for both pieces. And although this does not have the live jazz band that so enriched Chivu’s critically acclaimed production of Williams’ The Mutilated, the lone cello and guitar of Paul Brantley are evocative and score the particular settings and action perfectly.